Win a $20 Gift Certificate to Emerald Loop! Congratulations to Laura Anderson on winning our 145th High Five Giveaway! Thanks to all who entered. Our next High Five Giveaway is for a $20 gift certificate to Emerald Loop. 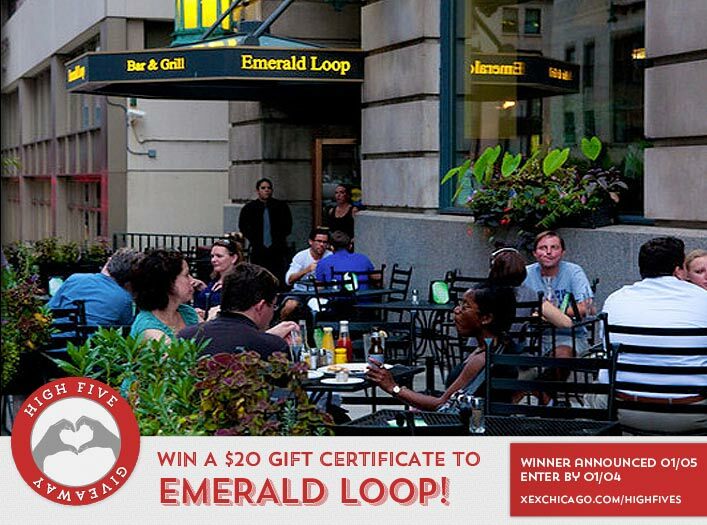 Emerald Loop is located at 216 N Wabash, Chicago. Visit their website at www.emeraldloop.com or call them at 312-263-0200. How many meals were we able to donate to Feeding America through year’s holiday benefit? Now, just add a comment to this post with the right answer to be eligible to win! The winner will be announced on Tuesday, January 5. Entries must be received by midnight on Monday, January 4. Good luck!